A new page on the SNAG website! Karen Christians has released a new book called Jewelry of Burning Man. This brand new photo-rich publication is a collection of works crafted for Burning Man, the annual week-long festival held in Nevada. Burning Man is founded on the principle of communal support and generosity. Unique to Burning Man, all the jewelry featured in the book was made for the sole purpose of giving it away. Terry Fromm has been Houston Center for for Contemporary Crafts’ resident artist for July and August. 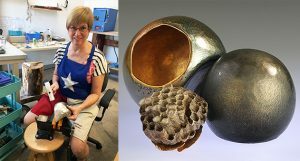 Her art is constructed from a variety of metals that are often manipulated so that they mimic the look and characteristics of other softer materials. Inspired by flowing forms observed both in nature and in draping textiles, she creates small quantities of finely crafted jewelry and small sculptural vessels. Kaminer Haislip is a finalist for the Martha Stewart American Made Award in the Design category. Haislip is a contemporary silversmith who designs and handcrafts original, functional objects. Anne Havel had work included in these exhibitions: In Essence: Celebrating 65 Years of Art at the Webster Estate, Southern Vermont Art Center, Manchester, VT; Force of Nature, The Karl Drerup Art Gallery, Plymouth State University, Plymouth, NH; Handcrafted, Maria V. Howard Arts Center, Rocky Mount, NC, where she earned an award of merit; Alchemy 3, Juried Exhibition of The Enamelist Society, Worcester Center for Crafts, Worcester, NH. 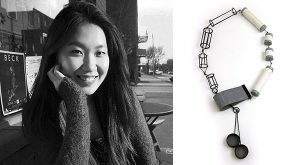 Younha Jung is a new resident artist at Houston Center for Contemporary Craft. Jung specializes in wearable modern jewelry. Her work expresses emotional changes that humans feel as part of a course of adaptation to the change in their surroundings. 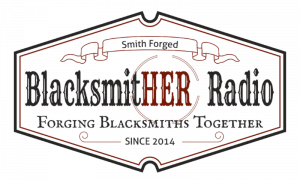 Currently, she is making jewelry made from re-purposed steel and found objects collected from a particular building. She will be with HCCC through May 2016. 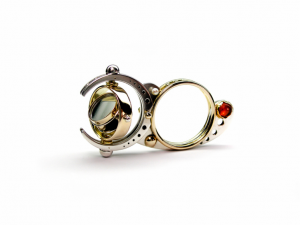 Claudio Pino’s rings are included in the exhibit Out of This World! Jewelry in the Space Age at the Carnegie Museum of Natural History in Pittsburgh, PA. In addition, for the celebrations of The Canada Craft Year 2015, initiated by the Canadian Crafts Federation, Pino was invited to present his rings in the traveling exhibition Naked Craft, currently at the Art Gallery of Burlington. Casey Sheppard is on a year-long U.S. tour to connect communities. She will be getting involved, volunteering, and teaching workshops, while keeping a blog about her travels. Casey is visiting schools, art centers and other venues to teach workshops on cold connection and found objects. She also invites students and staff to join her after the class for a tour of her traveling metal studio. Paul J. Smith has published a book called Masters of Craft. 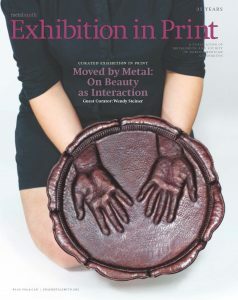 It is a personal collection of portraits taken by Smith featuring 224 artists working in fiber, clay, glass, metal, and wood. Smith is Director Emeritus of the Museum of Arts and Design in New York City. Collectively the photographs illustrate makers who have much in common and who are part of a community that share friendships, interests, and a belief in the importance of the handmade object. Of the 43 metal artists included, several photos were taken at SNAG conferences. 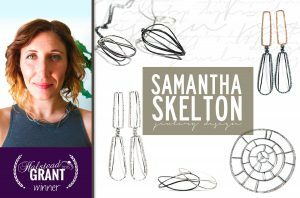 Halstead awards top honors to Samantha Skelton, artist and owner of Samantha Skelton Jewelry Designs based in Fairview, PA. The 10th annual Halstead Grant recognizes jewelry design excellence and business strategy acumen with $5,000 in cash and $1,000 in jewelry supplies, promotion on HalsteadBead.com and industry exposure. Skelton is an active SNAG member. 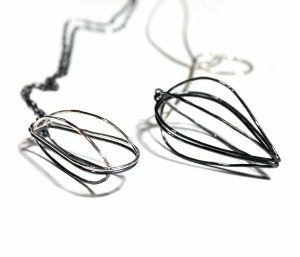 She studied fine art in undergraduate at Edinboro University and earned an MFA with a focus on metalsmithing from Miami University in 2013. Her delicate, sculptural jewelry has a modern, urban aesthetic. Skelton’s business includes custom jewelry, wholesale and gallery consignment in addition to art fairs and online sales.